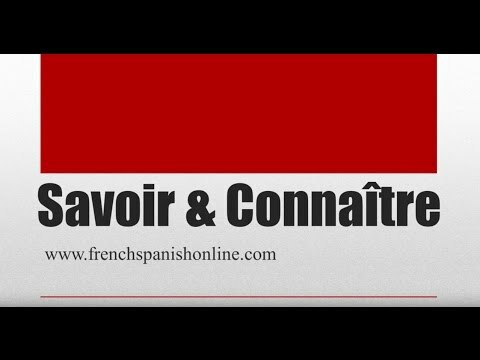 There are two verbs that mean to know in French connaître and savoir. Je sais qu'il vient ce soir. I know that he's coming tonight. Il sait ce que tu veux. Tu ne sais pas qui l'a fait. You don't know who did it. Ray sait combien d'allumettes il y a dans la boîte. Ray knows how many matches there are in the box. Elle ne sait pas où elle va.
She doesn't know where she's going. Ils savent à quelle heure le magasin ferme. They know what time the shop closes. Savoir can also be followed by an infinitive to express how to do [something], which can be equivalent to can do [something] in the sense of having a skill. Il sait jouer aux échecs. He knows how to play chess. Nous savons faire des muffins. We know how to make muffins. Est-ce que tu connais Philippe? Elle connaît cette recette par cœur. She knows that recipe by heart. In some cases relating to abstract things, both verbs can be used colloquially. Bonjour ! Nous savons faire des muffins. I hear the ‘s’ of muffins pronounced though ‘s’ in not pronounced in ‘tables’. Any exception? Actually, here in French, you shouldn't hear the "s", though the word is originally English. Je sais la vérité + Je connais la vérité both appear above. Both ok? Hi Len, as mentioned in the lesson, Je sais la vérité as well as Je connais la vérité are both correct, while the former is used more in a colloquial context. If someone knows when a shop is open, which is a fact, why is savoir used instead of connaître? Very good question, thank you very much ! The lesson needed to be clearer on which structures are used with either verb. These precisions have been added to the main lesson.